Is anyone else on the lookout for coyotes? I am. I am on complete Coyote Alert. Here it is this beautiful morning with mourning doves cooing and other birds chirping and not even any boom cars in front of the house yet. But I am thinking about coyotes and warnings I have read against them. They are becoming bold. And, as The Buffalo News wrote, wily! That is Wile E. Coyote pictured above. What about Jon Wile? He is a friend of Howard's and he is a lawyer which, I always think Jon Wile is a great Dickensian name for a lawyer. 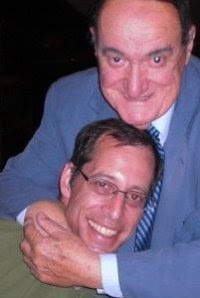 Jon While is new on Facebook and for his official Facebook picture he uses a picture of himself with Jackie Jocko. Ha, ha! It looks as if Jocko is holding Jon Wile's head on a plate! 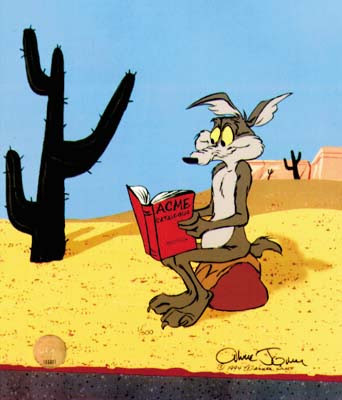 But back to the wily coyotes. Remember a few years ago, we had raccoons. There were all these warnings about raccoons taking over the City of Buffalo but I never thought much about it. This was about a year before I met Leonard Pennario so I do not know what I was thinking about. Do click on that Pennario link and you will hear him playing the finale of this Chopin sonata that he played better than anyone. It is ominous music. It is where the wild things are! Which brings us back to the raccoons. As I was saying, I did not think about the raccoon warnings. Howard and I were on the back porch. We have this postage stamp-sized back porch we like to eat out on in the summer and we were sharing this roast chicken. And all of a sudden an animal approached! At first I thought it was a cat. There is this fat sleek pretty cat that wanders our neighborhood and sometimes it comes up our driveway and a few times it has jumped up onto the porch. But this was not a cat! It was a raccoon! It was like the cat, only bigger. Fat and sleek and pretty. Howard and I agreed later it was a beautiful animal. But at the time we just sat there frozen. We didn't know what to do. The raccoon was giving us this friendly look as if to say, "Hi, neighbors. I heard you out here, thought I'd drop by for a bite of chicken." Then Howard and I made the instantaneous decision to start making noise and yelling at it. And the raccoon's face changed. It got a hurt look. As if to say, "What? What's wrong? You don't want to see me?" But the story is not over! A few nights after that we were back on the porch. And a raccoon came out onto our garage roof. We have a garage that is separate from the house and sits a ways back. But the raccoon could see us from there. We saw him looking at us. Then another raccoon joined him. And another! And another! Soon there were about a dozen. The garage roof was full of raccoons! They all were in constant motion, parading up and down, tracing loops this way and that. It was the most unbelievable sight. It was like a raccoon show of strength. I am haunted by that image, I have to say that. So often now if I look out toward the garage I remember when it was covered with raccoons. I wonder if that will happen with the coyotes. YAAAAA! At last! Now I know how to post on here and this is my very firt one. In the past, I never could get the 'Word Verification' to display a word to type in. Well then, the solution: Forget about using FireFox here and stick with the dreaded Internet Explorer. As much as I dislike it, at least it does work here! Let me just say that I dearly love this blog and it is always a high point of my morning to read it. Mary, you always start off my day with a big smile on my face. And sometimes, with tears of laughter streaming down my face. (Am I not supposed to laugh? How serious are we here?) Your writing style is awesome and I love it. Mary, you really, really do like those Brahms waltzes, don't you, LOL! Facebook...there is a young lady there that lives on the site and bombards me with constant IMs when I go there so I have ceased to go. It would be aweful for me to hurt her feelings and eject her. Soon, I will try again though. Ah, welcome to bucolia Mary. Our Coyotes travel in packs in Colden. The sound of the yipping in the woods tells us when they're close enough to keep the dog indoors. I saw one pop its head up out of the ditch next to the Thruway around Syracuse on Saturday. He did not have a TNT detonator from the ACME Company, though I did give him a "beep beep" as I passed. LarryC, I always use Firefox with Windows and Safari with MacOS, and I've never had a problem with these Blogger word verification things. The real question is, what do those words mean? Maybe you need to upgrade? I don't know. Anything but the evil Internet Explorer. Now, about those coyotes. I'm afraid the trap that my grandmother uses to catch squirrels, raccoons and groundhogs in her City of Buffalo backyard may be too small for coyotes. But then again, I imagine them to be quite tall, like Wile E. Coyote.